Stream continues the storyline set by Axess by introducing Duo, a being from outer space who seeks to destroy humanity after witnessing the chaos caused by Dr. Regal. Intrigued by Cross Fusion, he decides to spare mankind temporarily, bestowing a test upon the main characters to assess whether or not humans truly merit survival. He sends his subordinate, Slur, to Earth, where she hands Navis possessing the powers of Duo's asteroid to unsuspecting people to observe what they will do with such might. In the process, Neo WWW is formed by Tesla Gauss (Tesla Magnets) to cause havoc. Dr. Regal also returns during the movie, and again towards the end of Stream, with the focus of Stream shifting to time travel. There are no plans to bring Stream and or other NT Warrior sequels to the United States. The Megaupload links are dead, so use the others.. Episode 4: Salad Memorial Day?! Episode 5: Fly the Skies Flirty Rascal! Episode 7: Navi Car Race! Episode 8: Calling on Colonel! Episode 15: Icy Invention... de koff!? Episode 22: Dekao, Curry Takeover! Episode 27: Route-san's Close Call! Episode 39: Cross Fusion Impossible! You're my hero for posting this, you really are. 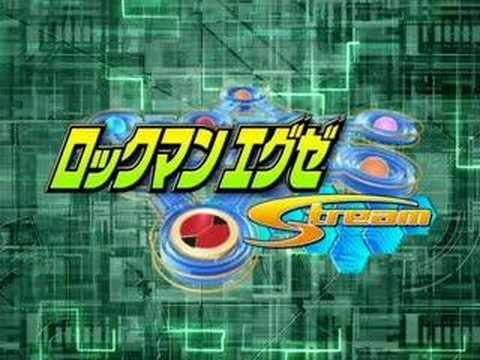 I've been searching for Stream season and never found anything subbed, I was actualy considering on dropping the anime or watching it all in japanese. Could someone please reupload them (all the links are dead), or tell me where could I download/watch them online. Unfortunately it seems like almost every episode of Megaman/Rockman on the Internet is dead, what I have here is what I've been able to find. Oh I thought you are the uploader. I found eps 1&2 but I'm having a hard time for 3 and 4. I know where to get 5+ though. Hey Bruno, could you post where you found those episodes at. If everyone can find an episode or two and post it, then Krogoth would be able to post them on the Main Topic post. They have episodes 25 - 51, and will be redoing episodes 1 - 24. They have everything, subbed and dubbed.